(Phys.org) -- Memory devices for computers require a large collection of components that can switch between two states, which represent the 1's and 0's of binary language. Engineers hope to make next-generation chips with materials that distinguish between these states by physically rearranging their atoms into different phases. Researchers at the University of Pennsylvania have now provided new insight into how this phase change happens, which could help engineers make memory storage devices faster and more efficient. The research was conducted by Ritesh Agarwal, associate professor in the Department of Materials Science and Engineering in Penn's School of Engineering and Applied Science, along with members of his research group. A.T. Charlie Johnson, professor in the Department of Physics and Astronomy in the School of Arts and Sciences, and Ju Li, now a professor of nuclear science and engineering at the Massachusetts Institute of Technology, also contributed to the study. Their research was published in the journal Science. "For many years there has been a push to find memory storage that is at once scalable, non-volatile and fast," Agarwal said. "Phase change materials could meet all of those criteria, but the problem is that we don't know much about how these materials actually work." Some kinds of memory, like a computer's RAM, can switch between states very quickly, allowing for the computation necessary to run programs. But this kind of memory is "volatile" in that it needs a constant supply of power to maintain its states. Other kinds of memory, like the kind found on a flash drive, is non-volatile in that it retains its data even after the power is turned off. This kind of memory, however, has low switching speeds. Researchers have long attempted to find a "universal memory" which combines both non-volatility and high switching speeds, along with scalability, the ability to store large amounts of data. While there are other contenders, phase change materials, or PCMs, are ideal candidates for universal memory. PCM storage devices are now starting to become commercially available, but their efficiency is hindered by the fact that the actual mechanics of their phase change are not well understood. The phases these PCMs switch between are different arrangements of their internal atomic structure. They begin in a crystalline phase, where their atoms are in an ordered lattice but can switch to a disordered, amorphous phase. The two phases provide much different levels of resistance to electrical current, which is why they are useful for memory storage. "When you have atoms arranged in a periodic lattice, electrons can flow very easily as they essentially know what to expect," Agarwal said. "But in the amorphous phase, there is no long-range order; there's no way to predict the position of atoms going from one part of the material to the other. This scatters the electrons, leading to very high resistance." It has been generally believed that the only way to switch between these two states involved heating, which allows the atoms to move out of their lattice positions as the material briefly melts, and rapid cooling, or "quenching," which solidifies the material into the amorphous phase without giving its atoms the chance to re-crystallize. "Now we have shown that there is a way to achieve this transition without melting the material," Agarwal said. "We show that short electrical pulses of a few hundred nanosecond duration gradually induce disorder in the material until it amorphizes." 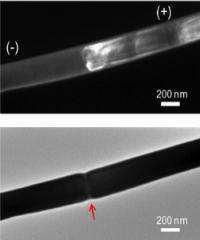 Their advance was made possible by fashioning a PCM into thin nanowires, rather than a more bulky counterpart. This enabled the researchers to observe the phase change as it happened using a high-resolution transmission electron microscope. Earlier researchers could only look at cross sections of their bulkier PCMs after the switching process was over. By looking at the change in "real time," the Penn researchers could see what effect the electrical pulses were having at an atomic level of detail. "The pulses create 'dislocations,' which are planes of atoms removed from the crystal pattern, disrupting the order locally on an atomic length scale," said Pavan Nukala, a co-author and member of the Agarwal group. "As we apply more and more pulses, the number of these dislocations start to increase." "Eventually, the dislocations start to move down the nanowire in the direction of the current," Agarwal said. "At certain point, the number and density of dislocations becomes so huge that they jam in one spot." Like a traffic jam on a highway, the dislocations continue to pile up at that spot as more and more move down the length of the nanowire. At a critical point, the increasing disorder causes the material to amorphize the wire at the location of the jam. The amorphous region, which always forms at the point of the jam and cuts through the entire cross section of the nanowire, is proof that this dislocation-based mechanism is fundamentally different from the melt-quench mechanism. With melting, the amorphous part should have spread along the surface of the material, rather than cut through its cross section. "Having the surface amorphize doesn't give us high resistance ratios because current can still travel through the crystalline interior," Agarwal said. "Cutting across the entire nanowire completely blocks the current, making for a much better memory devices. "With surface melting, you can increase the resistance a few times at most, but our observation that the resistance increased by two or three orders of magnitude is another evidence of the new mechanism." The PCM that researchers used in their study contained long tellurium-telluriumbonds that can easily slide apart, facilitating the planar dislocations that cause the material to amorphize. The material, along with a better understanding of the mechanics of its phase change, will provide a starting point for picking the right qualities for future PCMs. "If people think that melting is the only mechanism for phase change, then all the emphasis will be on making materials with low melting temperatures," Agarwal said. "But we've shown that we need to do something else, which is to also look for materials that can create dislocations easily."